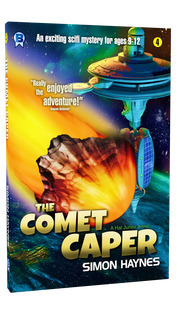 Hal Junior 4: The Comet Caper. 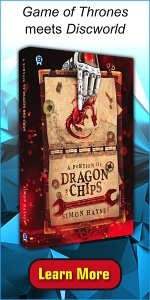 Book four in the Hal Junior middle grade science fiction series. Space Station Oberon is on high alert, because a comet is about to whizz past the nearby planet of Gyris. All the scientists are preparing for the exciting event, and all the kids are planning on watching. All the kids except Hal Junior, who's been given detention. Unfortunately the comet passes a whole lot closer than expected. Fortunately nobody is hurt, but the kids are trapped in one half, the adults in the other. Never mind. They have air and supplies, and they can all sit tight and wait for rescue. The scientists discover Space Station Oberon is now falling towards Gyris, faster and faster, and it's going to crash into the planet long before anyone can be rescued!